FILE - Migrants wait to register with police at a refugee center in the southern Serbian town of Presevo, Nov. 16, 2015. Newly elected Canadian Prime Minister Justin Trudeau will announce Tuesday his plan to resettle 25,000 Syrian refugees. Canada is extending its deadline for taking in 25,000 Syrian refugees to allow more time for screening and medical examinations. The end of November deadline has now been pushed back to the end of February, although Canadian officials still expect to allow 10,000 Syrians to enter the country by the end of the year. 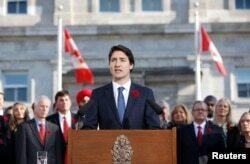 "We have a responsibility to significantly expand our refugee targets and give more victims a safe haven in Canada," the newly elected prime minister Justin Trudeau said Tuesday. Humanitarian workers across the Middle East have been gearing up for the massive airlift of Syrian refugees to Canada. It would be the biggest airlift operation since the start of the four-and-a-half year Syrian civil war that has killed hundreds of thousands and displaced millions. Canada says it is giving priority to complete families, gay men and women who face persecution in Syria, and those it calls women at risk. Air Canada has offered up its planes to aid in the airlift. FILE - Canadian Prime Minister Justin Trudeau speaks to the crowds in Ottawa, Nov. 4, 2015. Chartered private planes will fly the refugees out of camps in Jordan, Lebanon and Turkey with the military helping with flights as needed. More than 30 Canadian cities have been designated as destination cities. Canada expects to spend $678 million over the next six years flying out and resettling Syrian refugees. Canadians appear to be divided on Trudeau’s offer. A Forum Research Poll conducted in Canada on Tuesday showed that just over half of those surveyed disapproved of the government plan. Forty-one percent approved of the project. Claudia Blume, a married mother of two, told VOA she was getting ready to welcome one young Syrian man next week, the first of an extended family of eight that she and a private group of Canadians were sponsoring. FILE - A Syrian refugee child reacts while sitting in a swing in Al Zaatari refugee camp, in the Jordanian city of Mafraq, near the border with Syria, September 19, 2015. Blume’s sponsorship comes under the Blended Visa Office-Referred Program that matches refugees identified for resettlement by the U.N. refugees agency with private sponsors in Canada. The entire refugee family of two grandparents and three adult sons, one of whom is married with two young children, is expected to arrive by the December holidays. “We plan to have a Christmas party with the whole family,” Blume said. It is unclear how many of the 25,000 Syrian refugees expected to arrive in Canada will be privately or government-sponsored. The Canadian airlift comes in stark contrast to Thursday’s vote by the U.S. House of Representatives on a bill to suspend a program allowing 10,000 Syrian and Iraqi refugees into the country until national security agencies certify they don’t pose a security risk. The vote came after reports that at least one of the attackers responsible for the killings of 130 people in Paris had arrived in Europe on a Syrian passport pretending to be a refugee. The bill passed the House with a wide margin, 289-137, but its fate in the Senate is uncertain. President Barack Obama has vowed to veto the bill if it reaches his desk. At the same time, various countries in Europe are tightening their borders and reconsidering their refugee programs in the wake of the Paris massacre. UN Secretary General Ban Ki-moon on Friday criticized what he said were the misplaced suspicions about migrants and refugees, especially those who are Muslim. “We must uphold the human rights of migrants and refugees – especially in the face of rising xenophobia and discrimination,” Ban told a meeting of the UN General Assembly in New York. 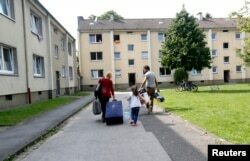 FILE - Lilas, a 4-year-old-refugee from Syria, and her parents walk to their refugee home in Muelheim an der Ruhr, Germany, after receiving articles for daily use prepared by donors at a distribution center on Aug, 20, 2015. He said that any fears about terrorists hiding among refugees only supported the argument for a better managed approach to the crisis. To date, Syria’s neighbors — Jordan, Lebanon and Turkey — have supported millions of refugees from the Syrian and Iraqi conflicts. “Having such few countries bear the responsibility is simply not a sustainable solution,” Ban said. Roughly a quarter million Syrians have died in the conflict, which started off as anti-government protests but quickly dissolved into a civil war which then further spiraled into a chaos of multiple conflicts.